Draw a circle. On the perimeter of the circumference make successive circles with the same radius. They will intersect in 6 equidistant points. Take each second point and connect it to the centre of the original circle. 2. Keep the same radius and starting from any point of the circumference (the circle line) draw a second circle. 3.From one of the two points where the two circles meet draw another circle. 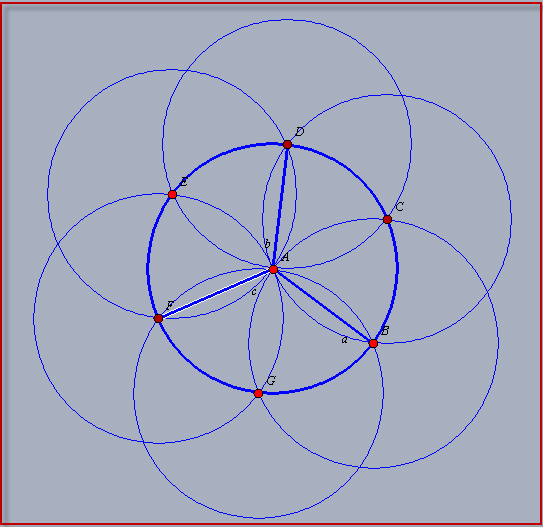 4.From the new points intersecting the first circles, take again one and draw another circle. 5. Repeat again the same procedure another 3 times for a total of 5 new circles . 6. Connect the centre of the circle with eacg SECOND new point on the circumference.